School Idols is not a thing here in our country. I mean, you don't see a high school group that is so popular having so much exposure on billboards, feeds online, local news and stuffs. 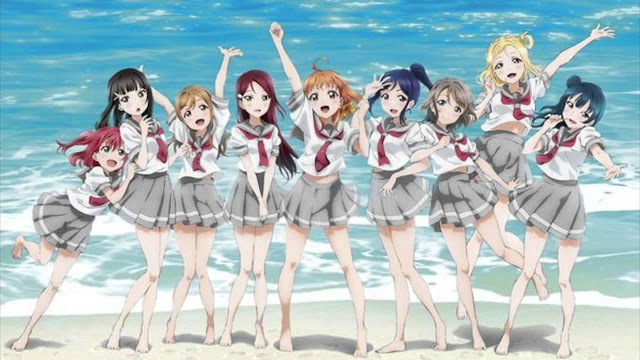 School idols here are like members of music club, dance club, drama club and such but they're only popular inside the school not outside or known to other school. Also highschoolers here tend to idolize members of student council more than club/varsity members. Well, that is what I observe as a teacher since I can hear gossips left and right from my students and sometimes the gossips goes through me. HAHA! Love Live! Sunshine!! is the second anime project for this big series. It is also the second project of Sunrise studio for this series. I don't know why Sunrise is the chosen studio to animated the story because Sunrise is well-known for their mecha animating magics not on this music-comedy genre anime. But since the studio is part of Bandai Namcco group of companies and the music label Lantis goes with it as well then I can't argue about this anymore. Sunrise did a very good job on both animation of Love Live franchise though. with School Idol project. Maybe a game and a light novel adaptation too as a result of successful franchise run. Anime like this often gets an OVA series and a movie to close the series even though there's a lot of things to add from its season ender.